I have been talking to my kids (ages 13, 6 and 4) about the Appalachian Trail when I stumbled upon this book. All three kids enjoyed aspects of this book. My teen enjoyed the description of a few trials along the hike and the map at the end. my six year old listened intently to the story the first time we read it aloud. And, my puppy-loving four-year-old asks me to read it over and over (and over) again. This is a lovely picture book about a woman's Appalachian Trail hike that she took with her dog. I loved the illustrations and the map at the back that marked where certain parts of their adventure happened . I would like to see her make this into a longer book for adults. It's an awesome book, but there is so much more to the story that I would like to know. A sweet children's book about a capable 60+ yo woman hiking with her young dog from Maine to Georgia on a thru hike of the Appalachian Trail. Inspirational for both the companion/animal relationship and the determination to complete the full 2100 mile hike; something I'd give to an adventurous youngster. A good dog story and adventure story. There is not much detail about their hike along the trail; only noting her fall and injury, the storm, and Ellie falling into the river. Good for Kindergarten through second grades. 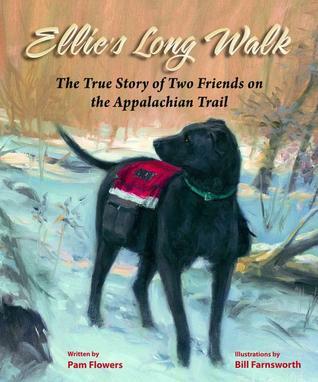 A picture book based on the true account of Pam Flowers and her dog, Ellie, hiking the length of the Appalachian Trail in 2008. I liked how the author explained her relationship with her dog in a concise manner. Not only that, it happens to be one of the few dog books I've read that ends happily!! I heard the author speak about this book and I feel that I got to make the trip too! Another crowd pleaser with this book. There is so much online to compliment the story including Flower's own website with pictures from the hike.